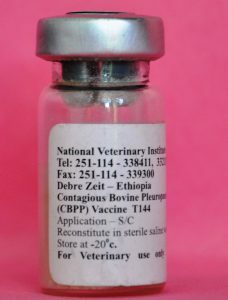 – It is a freeze – dried live attenuated bacterial vaccine produced using T1 44 or T1 SR strains of Mycoplasma mycoides subsp. mycoides Small colony (MmmSC). Each field dose contains at least 107 viable Mycoplasma organisms. – The vaccine is available in vials of 100 doses. – At -20 ºC minimum for 24 months. 100 ml of sterile cold saline water solution is used to reconstitute the vaccine. The reconstituted vaccine must be protected from light and heat and must be used immediately (the maximum limit is one hour when kept under cold condition). Inject 1 ml of the reconstituted vaccine only subcutaneously. Vaccinate all animals above the age of 6 months. – It develops 2 weeks post – vaccination and lasts for about 1year. A rare case of post – vaccinal reaction (mild swelling at the site of injection) can occur. If it ever happens antibiotics like Tetracycline, Oxytetracycline, Erythromycin and in severe cases Tylosine can be used.